1000 item memories for master data, such as item number, PRE-TARE (container weight), reference quantity, refere. weight etc. Ergonomic display device with large keypad and high-contrast LCD display for easy entry and reading of, e.g., tare weights, reference weights, limit values etc. [/]99 item memories for master data such as reference weight, reference quantity, container weight (PRE-TARE) etc. Up to now: Generally, the content of a bottle is established by a visual check, i.e. estimated, documented manually and then manually entered into the PC. New with KERN SMT: Now you can easily select drinks and spirits by item name, item number, autolist or using a barcode scanner, then you can weigh the bottle, transfer the results to the PC - and the stock taking is done! Counting with a reference balance for high counting accuracy: the highly accurate KERN FKC counting system can replace a whole range of individual balances, efficiently and at a reasonable price. Note: As well as stocktaking, the balance can be used in many other applications, e.g. 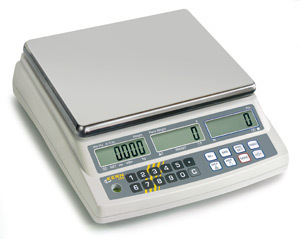 as a weighing scale, commissioning balance or as a professional counting scale with item memory for up to 500 items and associated daily totals memory for each item. USB data interfaces for transferring weighing data to the PC, printer, USB sticks, etc. Creation and recall items to be counted from the database (8 GB) with all relevant additional data such as piece weight, name, price, reference quantity, tare container weight, barcode, item image, etc.